A revolutionary new way to manage incontinence. This award winning absorbent underwear is so innovative that it was featured on Discovery Channel’s How stuff works and is designed to last 8 hours using NASA inspired multi layered InconTek technology similar to designs used by astronauts in space for long missions. 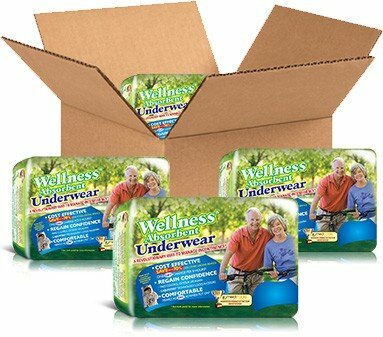 It not only absorbs dramatically more liquid than standard underwear but pulls it away from the skin and locks it in a separate layer leaving little or no opportunity for skin irritation and/or infection. It has a unique scheduled changing system and is therefore is one of the easiest to use. This is revolutionary because changes can actually be scheduled to only once in eight hours/ three in 24 hours putting the wearer or caregiver in control with no worry of any exposure to the effects of urine. 70% more cost effective than other absorbent underwear due to the minimal changes and rarely requires expensive creams or ointments. Unprecedented odor control. Also perfect for overnight use, travel or any time the wearer needs to go long periods of time without changes.